Delivering effortlessly smooth shifting without even the slightest bit of chain rub, Shimano's redesigned Ultegra Di2 8050 Front Derailleur benefits from many features brought down from their top-of-the-line Dura Ace lineup. Featuring a new shape that fits the wider gear pitches, Shimano brought the Synchronized Shift technology down, ensuring that you're always in the best gear placement. Two different settings change the way the derailleur behaves; with the Synchronized Shift setting, the front derailleur shifts automatically when a rear shift is made, while the Semi-Synchronized Shift setting allows the rear derailleur to automatically shift in response to front shifts. With the Auto-Trim feature, the derailleur automatically centers itself over the chain, eliminating chain rub and ensuring precise, smooth pedaling through your entire cassette's range. 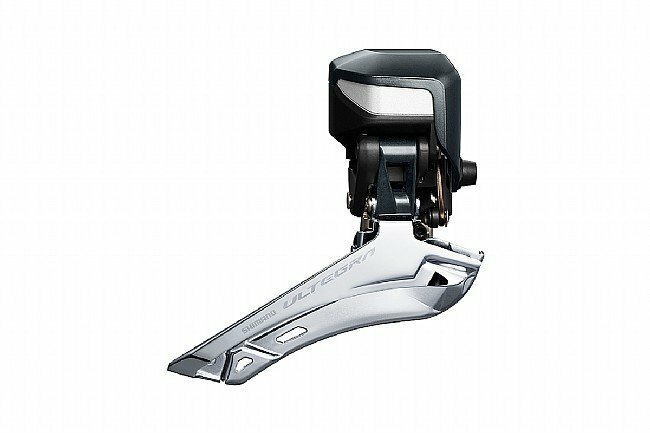 The Shimano Ultegra Di2 FD-R8050 Front Derailleur is compatible with double cranksets on Braze-on frames. Clamp adaptors are sold separately. Redesigned Di2 fits wider gear pitch without sacrificing shifting performance. Synchronized Shift and Semi-Synchronized Shift ensure optimal gear positioning. Auto-trim feature keeps derailleur centered over the chain through entire range of cassette. Exceptionally crisp shifting. Easy to adjust. It does exactly what you want electronic shifting to do. The elimination of the low limit screw means you use shift mode for small ring adjustments.